Overlooking the spectacular South West "Heritage Coast"™ of the Isle of Wight, Blackgang Chine is an eccentric mix of exciting rides, goblins and fairies, dinosaurs, nursery rhyme characters, cowboys and indians all set within rambling Victorian gardens and designed to appear to the child in us all! 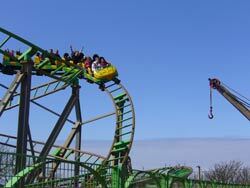 Family Attractions at at Blackgang Chine 40 acres of Victorian cliff top gardens hold surprises around every corner. Developed over many years include: Giant Hedge Maze, Water Gardens, Hall of Funny Mirrors and viewpoint picnic areas. The Crooked House, The Musical Pet Shop, Triassic Dinosaur Club, Smuggler's Cave the Weather Wizard, Rumpus Mansion and the Sleeping Beautys Castle. Designed to stimulate children's imagination include: Dinosaurland, Nurseryland and Fantasyland. A full sized Cowboy Town and a Pirate Fort provides adventure play as does a full sized Smuggler's boat. Water Force, Pirate Barrel Ride and Cliff Hanger.